When Sonet Meintjies, a base jumper, falls to her death while attempting to parachute off a newly built sixty-five-story skyscraper in Johannesburg, South Africa, it seems like she simply had a serious case of bad luck. However, her jumping partner insists that the horrible accident was not accident. Despite the fact that he was the only one with Meintjies that night and thus a suspect if there was foul play, he hires private investigator Jade de Jong to uncover the truth. Although she's a tad reluctant at first, Jade takes the case. Almost immediately, a second set of footprints tells her Meintjies might have been murder. As Jade looks into the victim's past, she finds she for a charity that helped impoverished communities become self-supporting farming units. It sounds like a great project, but when Jade pays a visit to one of the farms, she finds there's nothing there. Apparently an unidentified fatal disease decimated the community, and it's linked to the practices of the charity and to the base jumper's death. 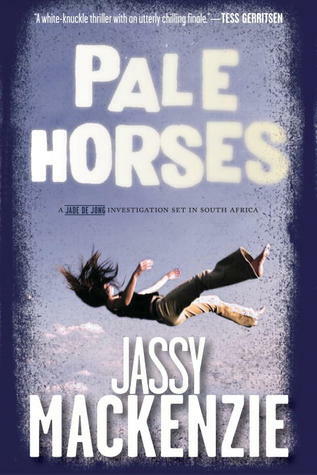 The first element that makes Pale Horses a great read is Mackenzie's pacing. Instead of jumping into the action and letting the bullets fly, the author takes her time and allows the tension to build slowly. I was afraid that by delaying the action I would get bored, but the intricate story was well crafted and kept me interested. Then, by the time things exploded and Jade is running for her life, bad guys with guns and bad intentions behind her and pit bulls barking in her face, the change of pace was much more satisfying than it would've been if the story was packed with action from the beginning. Besides the great storytelling and balance between tension and violence, there are a few other elements that make this a solid thriller. For starters there's the characters, which Mckenzie carefully develops as multilayered individuals through whom the story is told rather than having them play second fiddle to the mysterious goings-on that Jade is trying to uncover. Both Jade and David Turffontein, a detective and love interest who shares a tumultuous past with Jade, are likeable. However, the richest character might be Ntombi, a young mother forced to work a dangerous job to feed her son and who knows a lot about what went wrong in the farm. Also, between the towns, descriptions of the landscape and people, and even the use of Afrikaans, South Africa becomes as silent character that somehow speaks volumes about itself through the author's descriptions. Pale Horses brings together a great plot full of real-world implications, interesting characters, a lot of tension and secrecy, death, injustice, a good dose of action, and a nice finale that I won't give away here. Although this is the 4th book in the series, it can be read as a stand alone novel, and it deserves to be read.